Made entirely of aluminum, available in three sizes, standard, Large and Extra Large. Both units feature a front and rear access locking door. 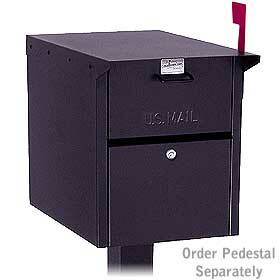 Mail is deposited through the front on all models. Each unit includes an outgoing mail tray, a lock with two (2) keys on each door (keyed alike) and an adjustable red signal flag. Units are available in a black, white, green or silver powder coated finish.